If you know just a few rudimentary crochet stitches it's easy to outfit your kitchen with hand-crocheted dishcloths. These fast projects make great gifts or quick-finish projects for testing a new stitch pattern, or try making up stacks of them to sell at craft fairs. They're functional items that work well and also look pretty. Try these two original patterns to get started, or a few of the many free patterns that follow. With so many options to choose from there's no reason not to have a large supply on hand. This dishcloth is simpler than it looks to make; all you need to know is how to chain, single crochet, and double crochet. Exact gauge is not important for this project. Chain 28 stitches for a small dishcloth, or 34 stitches for a larger dishcloth. Work 1 single crochet (sc) into the 2nd chain from hook; work 1 sc in each chain until the end of the row. Chain 3 stitches and turn. Skip first sc, and work one double crochet (dc) into each remaining sc. Chain 3 stitches and turn. Back post double crochet (BPdc) around each of the next two dc stitches. (Front post double crochet (FPdc) around each of the next three dc stitches, BPdc around each of the next three dc stitches.) Repeat the pattern inside the parentheses until the end of the row, ending with 3 BPdc. Chain 3 stitches and turn. Repeat the last row until the dishcloth is as long as desired. Work a final row of single crochet. Snip the yarn, leaving an 8-inch tail, and draw that tail through the loop of the last stitch. Use a yarn needle to weave the loose tails into your dishcloth, then clip any extra yarn remaining. This simple scrubber fits over your fingers and palm, but leaves your thumb free for extra dexterity. The ribs give the scrubber extra cleaning power but are very easy to make; all you need to know is single crochet and slip stitch. Chain 15 stitches for a small scrubber, or 21 stitches for a large scrubber. Work 1 single crochet (sc) into the 2nd chain from the hook. Work 1 sc into each following chain until the end of the row. Chain 1 and turn. Work 1 sc into the back loop of each sc in the previous row. Chain 1 and turn. Snip the yarn, leaving an 8-inch tail, and pull that tail through the loop of the last stitch. 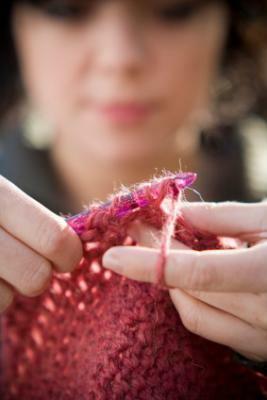 Use a yarn needle to weave the loose tails into the fabric, then cut any remaining excess. Place the two scrubbers together and slip stitch around the two long edges and one of the short edges, joining them together. Leave a small hole for your thumb; either single crochet along just one of the halves to skirt the hole, or clip the yarn and weave the end in, then use a new strand of yarn to complete the remaining few slip stitches on the other side of the thumb-hole. Using simple stitch patterns and shapes, these cloths are quick and easy to work up anytime. Using variegated yarn to make this basic square dishcloth results in a beautiful pattern. This ribbed single crochet dishcloth has a little more scrubbing power than some of the other patterns. This dishcloth owes its lacy look to spaces between the half-double crochet stitches. This creative pattern starts as a ridge washcloth, then transforms into a long-lasting spiral scrubbie. Most of these patterns are not difficult to make, but may involve more advanced stitches or use a greater range of techniques than more basic dishcloth patterns. This lacy granny square is perfect for a country Victorian kitchen. The treble dipped dishcloth combines treble and double crochet stitches to make an interesting two-color pattern. The wavy rows in this pattern make a pretty dishcloth. This small project is a good way to learn this versatile pattern. Unusual cloths are sure to be big sellers at church bazaars and craft shows, and welcome gifts for any occasion. This striking, angel-shaped dishcloth owes its appeal in equal parts to the clever design and to the use of a bold, variegated yarn. Crocheting this ruffled dishcloth isn't that difficult, but the results are spectacular. This "floppy scrubbie"--crocheted around a conventional dish scrubby--really does look like a floppy hat. This ballerina dishcloth may be all it takes to get some of your kids interested in doing dishes. When you choose a pattern, the first thing you should do is check the list of required materials to make sure you have the correct crochet hook sizes and suitable yarn. Also, read through the pattern to make sure you can do all of the required crochet stitches. Once you've mastered a given pattern, you can easily finish a new dishcloth in a few hours. When you find a pattern that you love print it out and slip it into a plastic notebook sleeve, keeping it safe until the next time you want it. If you need help downloading any of the patterns, check out these helpful tips. Hand-crocheted dishcloths aren't just for washing dirty dishes. Some of the thicker versions can also be put to work as hot pads, and they can almost always be used as decorative washcloths in the bathroom, too. A few of the more delicate patterns are pretty enough to use as doilies or you could hang a few on the wall for decorations. No matter how you use them, these dishcloth patterns are so versatile, functional, and pretty that you might as well keep a few on hand for last-minute gifts and miscellaneous uses.